Nine year-old Anya, or better yet, Scalpel, introduces herself to readers and to someone off panel. Genetic manipulation has given her the functional age of seventeen. The only parents the girl has known is the person or persons to whom she is speaking after Darkseid attacked Earth 2. Now, Scalpel's only goal is to help that being conquer New Earth 2. Hawkgirl has escorted Fury to Neotropolis, while they're greeted warmly by numerous wonders, Wesley Dodds expresses what is on the minds of many. What are Fury's intensions? Are they peaceful, or could another war be on the horizon for the inhabitants of New Earth 2? Only time will tell. Fury has been open about the Amazons and Atlanteans' original plans to take over New Earth 2, how they changed their minds when Alan Scott gave up the power of the Green Lantern to prevent a war and save the world. Fury continues her discourse by revealing information on the Pandora Vessel. Knowing that it brought back Fury's people, many of the planet's superheroes wonder if the device could resurrect the original Earth 2 and those killed in the war with Apokolips or if it could bring about Armageddon. Two more genetically accelerated children - Eli and John, codenamed Grief and Firepattern respectively - have introduced themselves to the reader. They are part of the Ultra-Humanite's army of Humanites. Their objective is to aid their new father in his conquest of New Earth 2. The young soldiers fly off to begin the first phase of the villain's sinister plot as he orders them to stop Fury from using the Pandora Vessel and bring it to him. Story - 5: Dan Abnett's run as writer has been a great one so far. In fact, he's, quite frankly, saved this title. The story is the saving grace of the issue. Had another writer worked on this book, it might be unreadable, but that's not the case. Abnett gives this comic the kick in the backside it needed, and he's made it an entertaining one to read. Art - 2: It's not completely bad, but when one considers how good the art's been in this series, it's horrible. Pages look rushed with panels that look like they meant to meet a deadline instead of help tell the story. Sadly, the visuals bring down the quality of Dan Abnett's incredible writing. 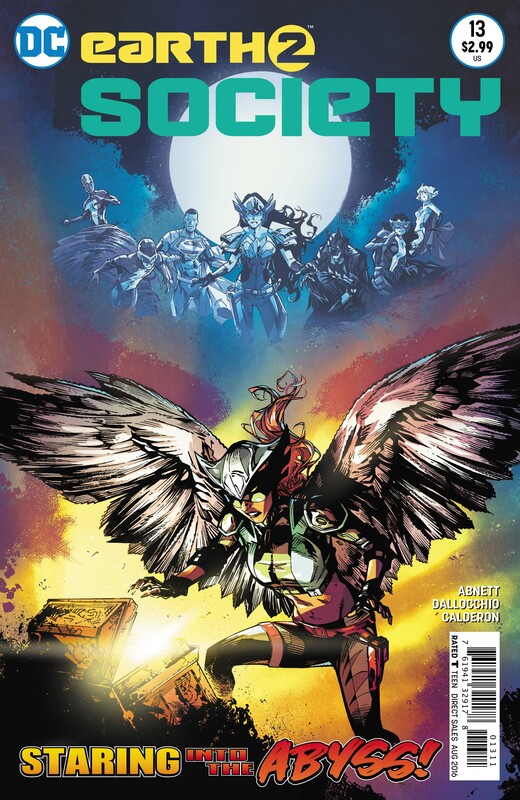 Cover Art - 3: The artwork is good, and it does make me curious about the book's contents, however, something about how Hawkgirl is drawn just does not look right to my eyes. Note: Except for digital first releases, the month dates are from the issue covers, not the actual date when the comic went on sale. Back to the Mild Mannered Reviews contents page. Check out the Comic Index Lists for the complete list of Superman-related comics published in 2016.